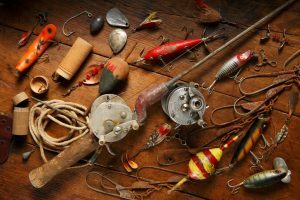 It probably never crossed your mind, but that long forgotten box of fishing tackle that your great-grandfather left in the attic, might just be worth a pretty penny. Indeed, in the turbulent world of antiques and collectibles, there is an exciting niche for those specialised in fishing tackle and gear. To a fishing aficionado, an old fishing rod and tackle or anything fishing related are as attractive as a Leonardo da Vinci masterpiece to an art collector. It makes perfect sense if you think about i. You can seldom find two more fanatical groups of people than art collectors and fishing buffs. When you combine the two, you have the recipe for true collector’s fever. The most important question now is what makes a particular piece of angling tackle a prized collector’s item? As in any field, there are specific tips, tricks, and trade secrets that professionals jealously save for themselves. However, there are a few general guidelines that you might want to follow in order to become a fishing tackle collector yourself. The golden rule is that the rarer or older something is, the better. For instance, let’s say that you are interested in fishing lures. Those made by famous early manufacturers, such as Heddon and Pflueger, are most coveted among collectors because they were first mass producers of fishing lures. They are the oldest, rarest and most valuable of all commercially produced lures. Keep in mind that there are also many other subtleties you must pay attention to. In the world of collectible fishing tackle, the materials also play a great role. Natural materials were the first used for the production of fishing tackle, so items made of wood or bamboo (especially split bamboo fly rods), command the greatest prices on the market. That being said, the modern fishing tackle can also be valuable and sought after by collectors, depending on the design, exclusivity and circulation.Sometimes, even the most recent items can prove a good investment, because the things you acquire today may very well become the fishing technology collectibles of the future. There is one more aspect of fishing tackle collecting that needs to be pointed out. The items value is not just attached to old or rare pieces of angling technology, but also to its general history. There is a special category of angling-related items that belonged to famous historical figures. Items that fit into this category are the rarest and most exclusive of all. A Hardy Fairy bamboo fly rod is a valuable object in its own right, but a Hardy Fairy that belonged to Ernest Hemingway is a priceless relic. If you are starting to feel that collector’s fever and you want to acquire some pieces of angling equipment, then keep these tips in mind as they might come in handy. Whether you just want to browse or are already familiar with the field of angling collectibles, places like Barnebys.co.uk are usually a great way to start.